Needle Art Tattoo is onderdeel van IQ Tattoo en staat garant voor uitstekende service, professionaliteit en oneindige kwaliteit op het gebied van tatoeëren. Alle studio's aangesloten bij IQ Tattoo blijven hun huidige naam voeren en zullen als vanouds blijven werken. Het enige verschil is dat er meer samengewerkt en uitgewisseld kan worden tussen de residentiële- en gast artiesten die ieder hun eigen, unieke stijl en manier van werken hebben. Needle Art Tattoo is part of IQ Tattoo and guarantees excellent service, professionalism and infinite quality of tattooing. All studios affiliated with IQ Tattoo continue to use their current name and will operate as usual. The only difference is that there will be more interaction and collaboration between both resident- and guest artists who, of course each have their own unique style and way of tattooing. 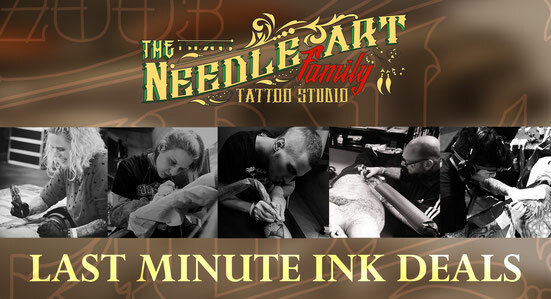 Several artists at Needle Art Tattoo are certified by True Artists. With great pride we can say Eugen Mahu, a resident artist at Needle Art Tattoo became an official TAP artist in 2016. TAP or Tattoo Art Project is gathering the best realistic tattoo artists in the world to display their work and related information. The main purpose of the Tattoo Art Project website is to create a network of International tattoo artists that are among the absolute best in the genre of “realistic”. New tattoo artists will be added continually, and sorted by country and name.